GREECE AND WORLD: The E.N.D. is back! 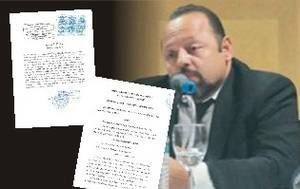 Three days ago the lawer of Artemis Sorras George Papadakis, filed and extrajudicial that was sent to the Greek Government, the Ministry of Finance, the Bank of Greece and the prosecutor of the Supreme Court. According to Mr. Sorras' s extrajudicial claims that he was halted by false reports in the press and the internet while was trying to help Greece with his money. Mr Sorras claims that his proposal to the greek government was never examined as it should be. Ηe says it is the duty of politicians to consider the proposal, as it is for the interest of Greece, otherwise they will be sued for treason. 600 billion Dollars deposited from abroad Greeks , to erase the debt! She came, saw and left!